What is the F&T Overdrive Unit? 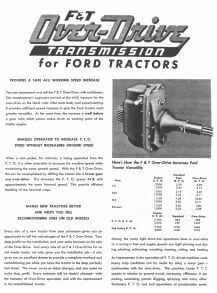 One of the more rare auxiliary transmissions is the F&T overdrive unit from the mid ’40s. Basically the same as a Sherman step-up or Hupp overdrive unit, it apparently never sold well and it’s unusual to see one today. 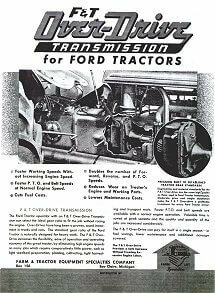 There have been other manufacturers of auxiliary transmissions mentioned in Ford Tractor reference books, etc, but if they existed at all they are very, very rare. 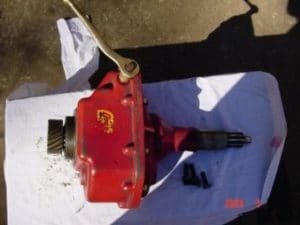 If you’re thinking of adding an auxiliary transmission to your N-series Ford, the best bet today for availability is still the Sherman. 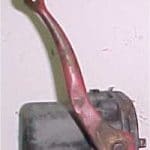 Used Sherman transmissions and parts for the transmissions can still be found in salvage yards, at swap meets, etc.